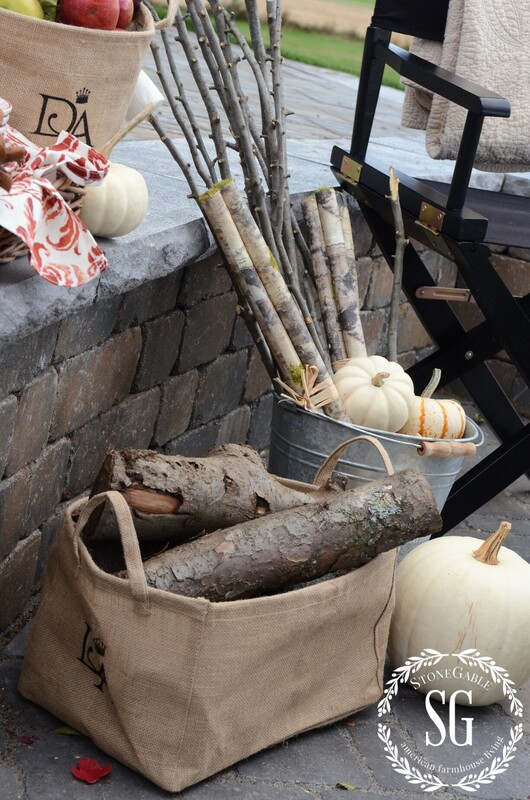 Here’s an easy and fun way to entertain this fall! Create a S’more Bar that transports nicely to the fire pit! We love love love spending chilly evenings around our fire pit, wrapped up in cozy blankets… toasting marshmallows and eating S’mores. I am crazy about burnt marshmallows. So while family and friends are gently toasting and roasting their’s I’m creating marshmallow fireballs! Oh so yummy! 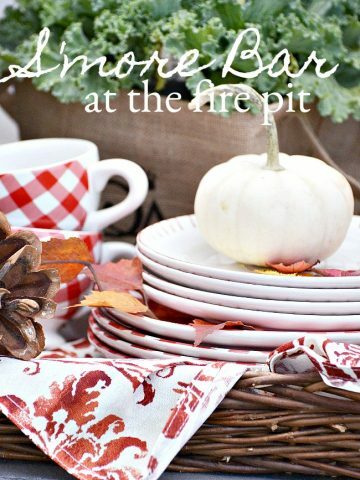 I’ve teamed up with HERITAGE LACE to bring you a fun fall S’MORE BAR AT THE FIRE PIT! I have been compensated for this post, but the opinions are mine. Here’s a view from our fire pit. The farmer just harvested the soybean field. Our views are always changing with each season! I set up a S’more bar on the sitting wall by our fire pit. 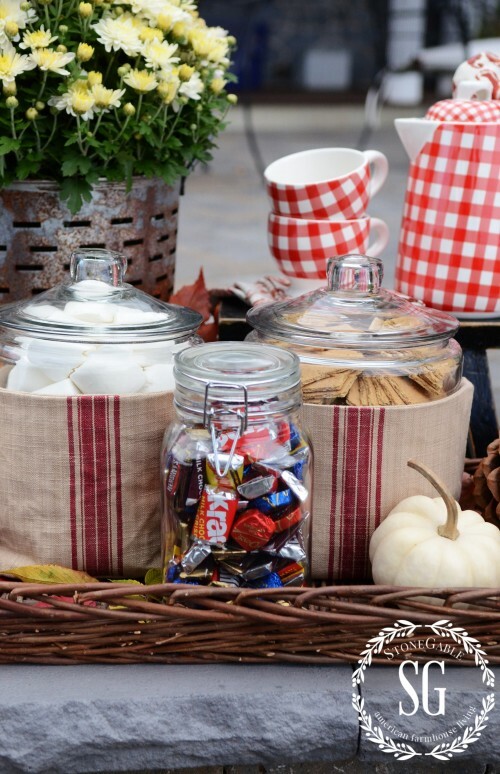 I used big glass jars to hold the marshmallows and the graham crackers. I slid them into these soft grainsack-like baskets. They fit like they were made for each other. When it comes to making the best S’mores I found that 2 mini chocolates work better than a half a chocolate candy bar. How about a Mr. Goodbar S’more? Sounds yummy! My favorite S’more has 2 Dove milk chocolates, 1 jumbo marshmallow and of course graham crackers! I didn’t burn the marshmallow as much as I normally would… it would not make a very pretty picture! Don’t you love these sweet dishes? 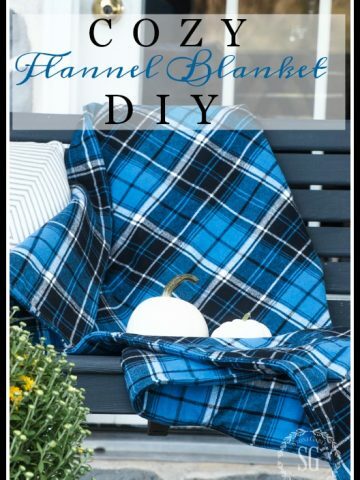 The red and white check as well as the blanket stitch stole my heart!!!! 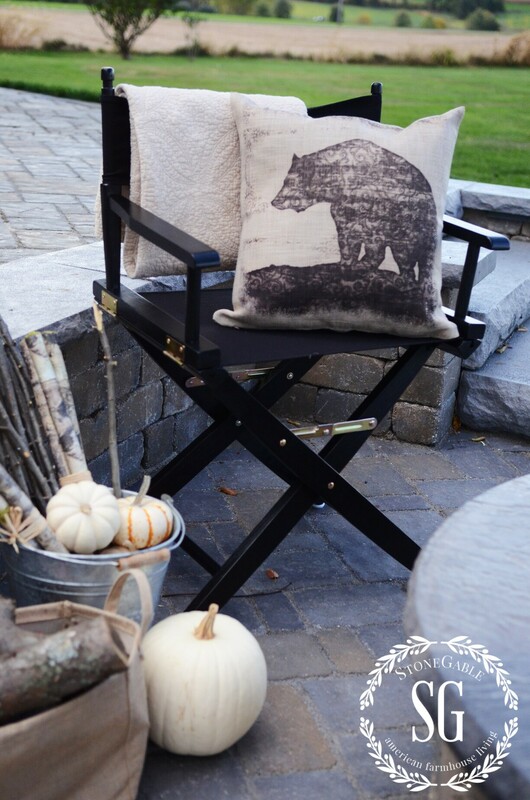 Perfect for a cozy fall setting! The dishes came from Heritage Lace and you can find them HERE! Just look at the bottom of the cups!!! So well made!!! Oh, I love attention to detail!!! I can use these for Christmas, Valentine’s Day, and all the summer holidays! 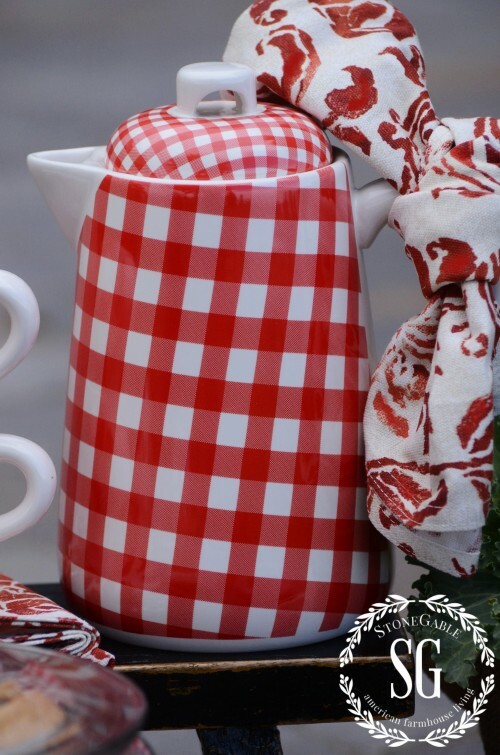 And while I’m showing off the red and white checks… look at what I am serving hot chocolate in! So precious!!!! I tied a red and burnt orange napkin around the handle just for fun! 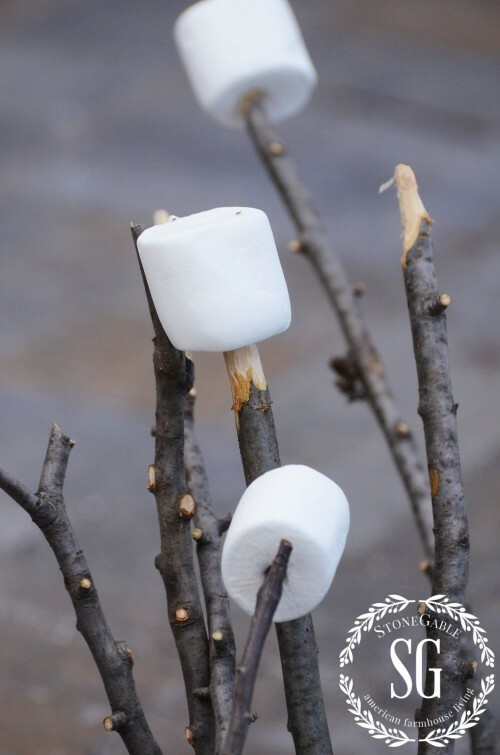 Marshmallows are on sticks and ready to toast!!! 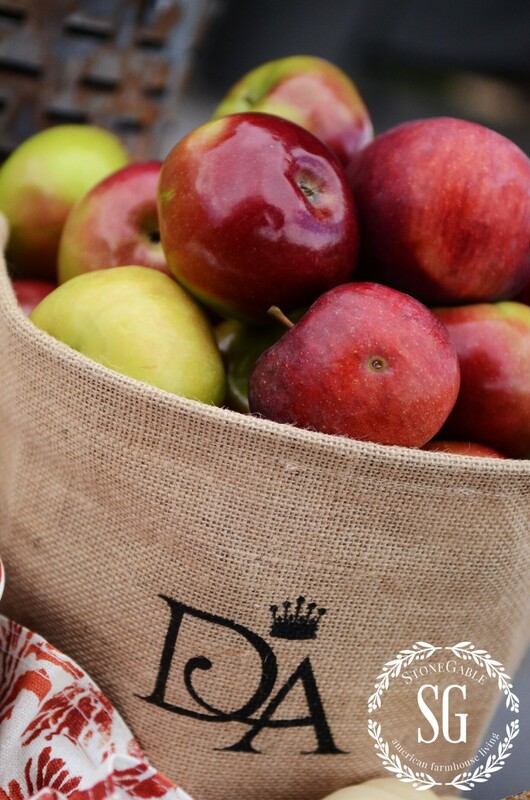 I used a soft burlap storage basket to hold apples from our tree. The “DA” stands for Downton Abby. Heritage Lace has a whole collection of wonderful Downton Abby wares! I’ve come to appreciate a few imperfections on my apples! There is nothing like a juicy organic apple right off the tree. 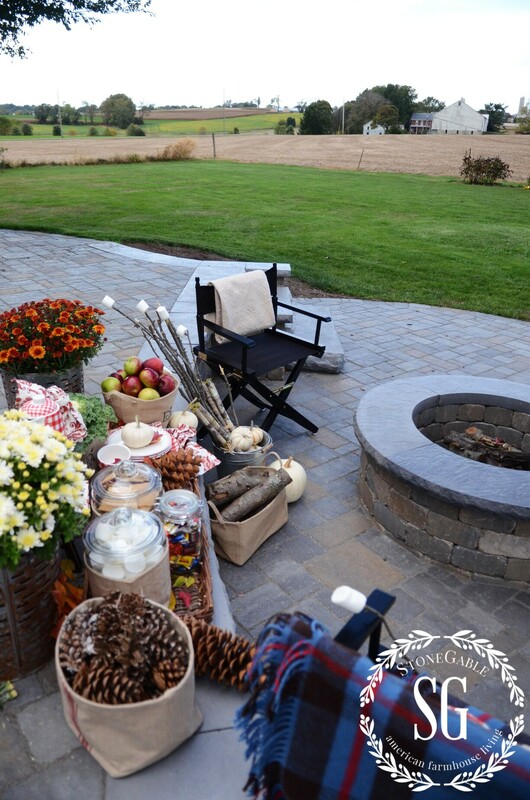 When Bobby get’s home we will have dinner out here by a roaring fire! 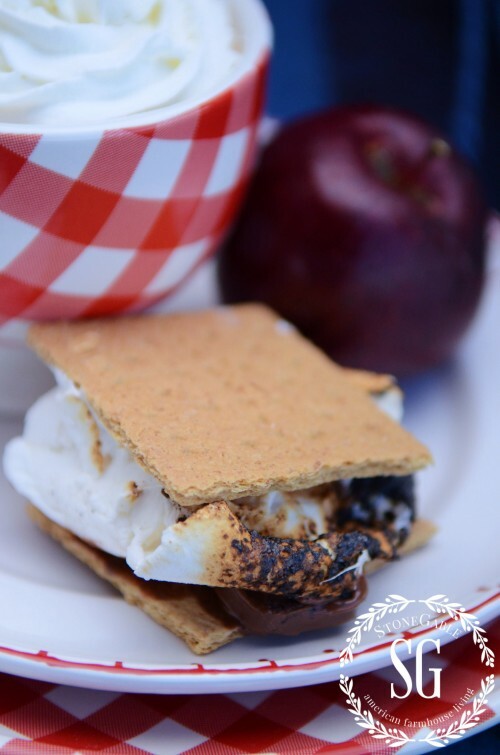 Then we will chat and have a S’more or two… and maybe an apple. 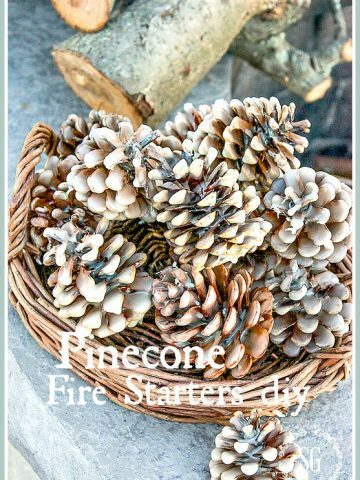 Did you know that pinecones make fabulous fire starters? I’ll show you how to make some next week. They are so pretty and they make wonderful gifts! I’m already thinking HOLIDAYS! I put a soft basket of pinecones close at hand! I originally wanted to put Adirondack chairs around the fire pit. They are sooooo romantic! However, not very practical! Director’s chairs work much better. 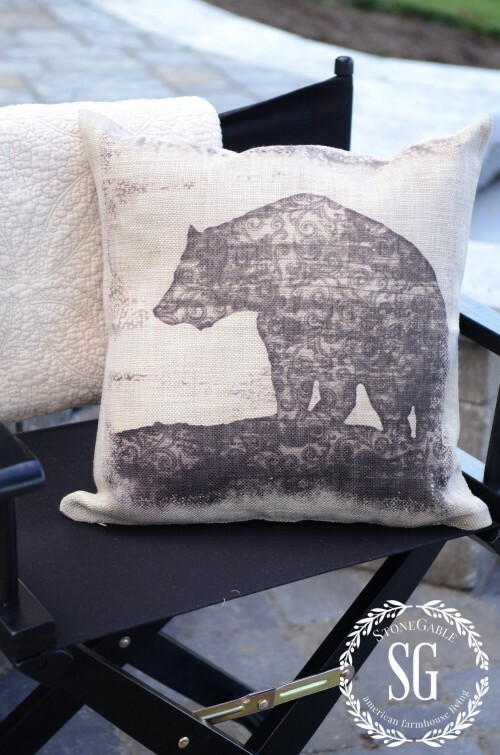 Look at this sweet bear pillow! They are filled with polyester so they work great outdoors! You can find them HERE. If you are in my neck of the woods and see us at the fire pit come on and join us for a S’more… or two! A big thank you to the kind folks at HERITAGE LACE for sending me BEAUTIFUL homewares!!!!! Make sure to stop by their site and check out all the items in my post and more!!! You might want to pin this to your FALL pinterest board. You can follow me on Pinterest HERE and see what I’m pinning! We often entertain around the fire pit. I take the leftover mini candy bars from Halloween and peeps from Easter and store them in the freezer for s’mores. For the last campfire I made strawberry flavored marshmallows. They were so much tastier than the store bought variety. 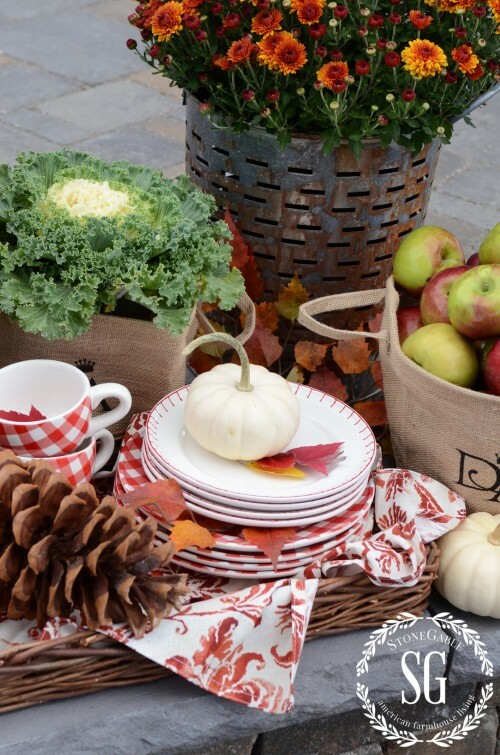 Love your blog-it has inspired me to decorate my home and change things up with the seasons. I just love the red and white check!! You have given me such inspiration for a get together with some girl friends to celebrate Spring. 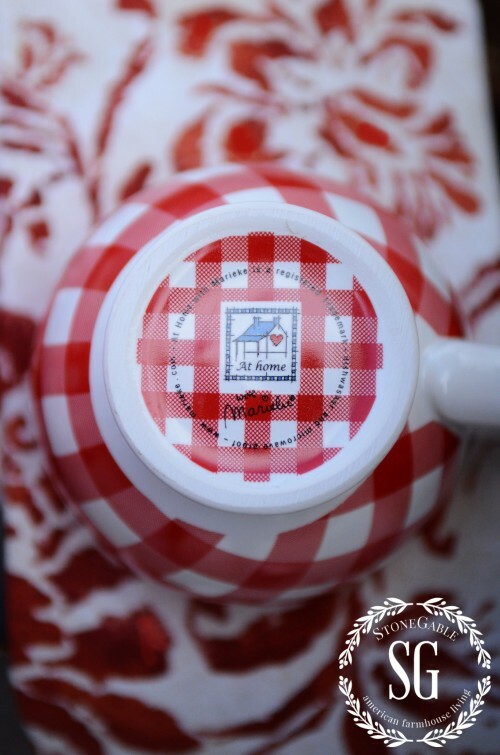 Although we do not have the tea/coffee pot available here, I am sure I can find some beautiful red and white check cups somewhere. I have been enjoying your blog! I love your idea of using various miniture chocolates for smores. I can’t wait to try them out with our adult children and their significant others! I love this idea. These smore’s look so delicious! But my favorite part are the cute red & white dishes! You always have the perfect dishes for any occasion. Love it!! Yvonne, you have a knack for making everything look beautiful and festive. 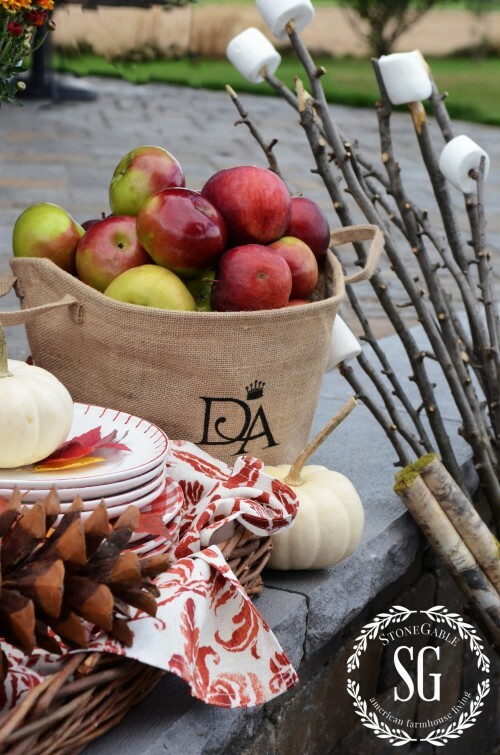 By the way, does the “DA” on your burlap apple basket stand for Downton Abbey? What a beautiful space for enjoying a nice treat, Such cute dishes and I love red! 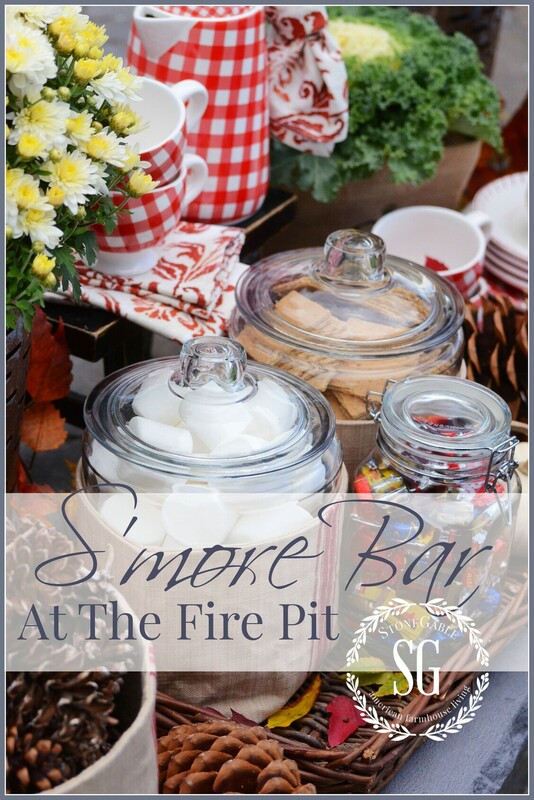 Oh so wonderful Yvonne, you haven’t neglected a single detail with your fabulous S’mores Bar! Those red and white checked dishes are adorable and so versatile too! Once again your vignette has given me moment to pause. Such simple sophistication, thank you once again for sharing your prowess in staging beautiful spaces with us. I love your post. So cozy and fun. Love all the colors and beautiful details. And yes, Dove chocolates are wonderful Hope to get outside, soon. We are in Alabama and the mosquitoes are terrible this time of year. It was 92 yesterday!! Everything is so pretty! Those dishes will be nice at Christmas for layering! 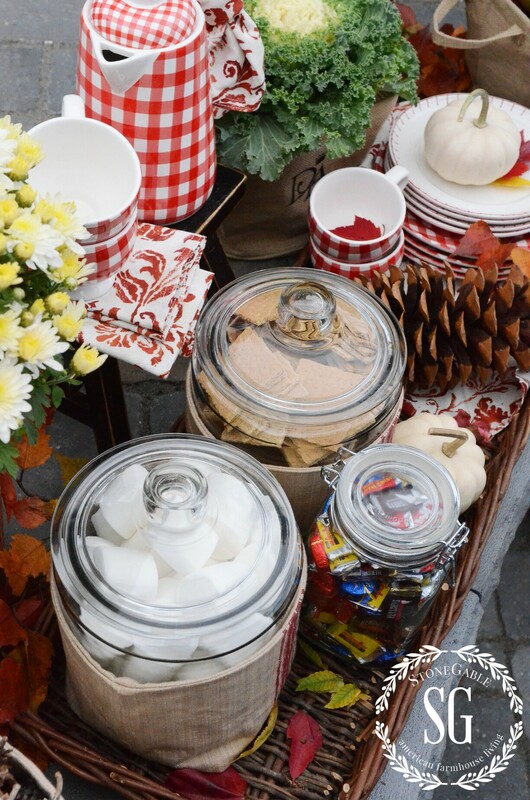 Such a wonderful Idea and everything looks so fun and festive! How fun is that! 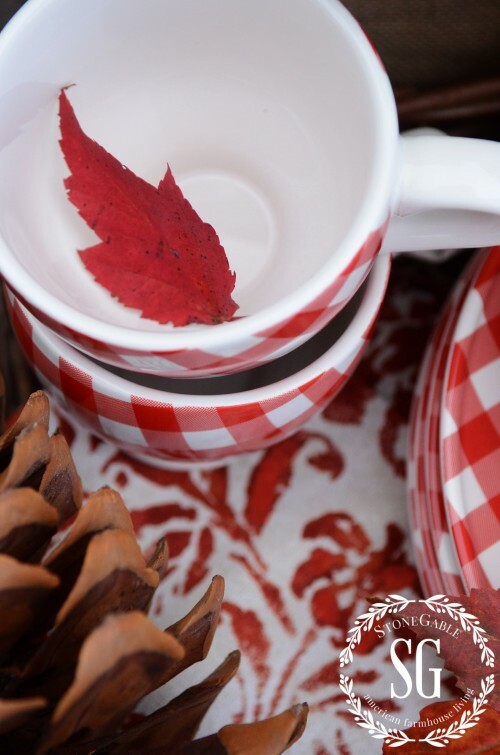 I love your red checked ware as I have a set of Ralph Lauren red checked dinnerware. I don’t use it often since we moved to AZ, but it does come out for the month of February. Oh my goodness! 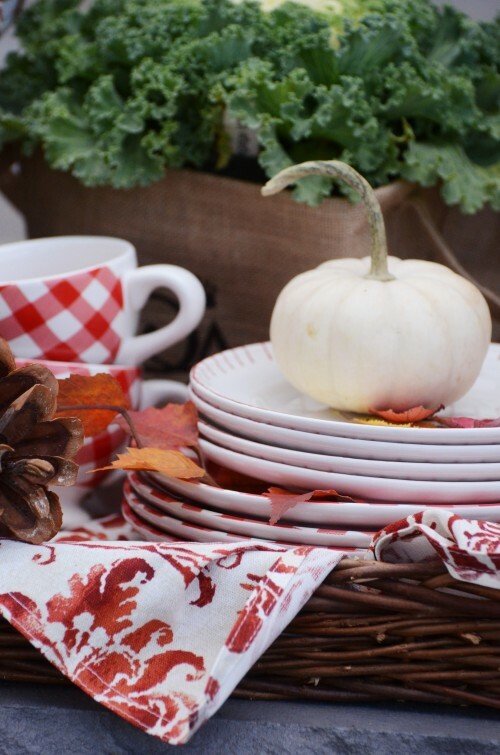 I am in love with those red and white dishes…the check and the blanket stitch! And all those fun burlap covers for jars too. 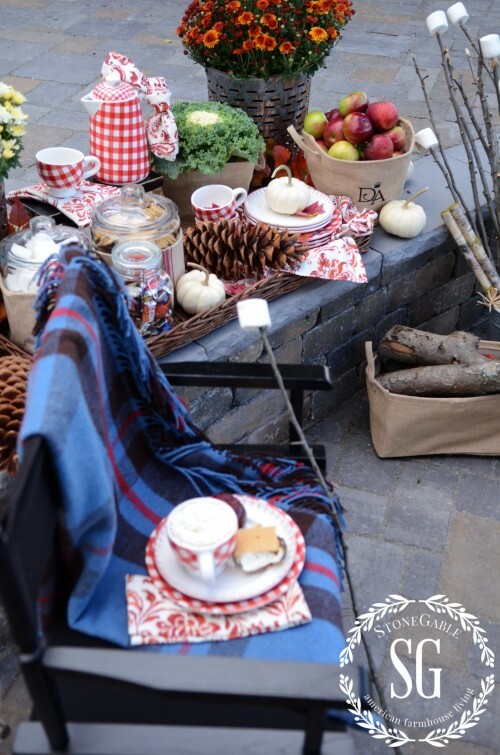 You do such a beautiful job of layering all the elements for a S’more roast…and your photos are lovely. Thanks for the eye candy! I did not know that about pinecones! I love your smore bar! So cozy! YOu don’t know how much I’d love to see your pretty face here at StoneGable!!! YOU are welcome anytime! Even though I have personally taken a break from blogging since this spring, I always find myself drifting over to Stone Gable. Stone Gable embraces everything that drew me to blogging. Your work is always, always beautiful and uplifting. Thanks so much! We wait for your return, dear friend! Thanks for the wonderful idea and great presentation. I love the napkins, did you make them? The napkins came from HomeGoods! Oh my gosh I love this! 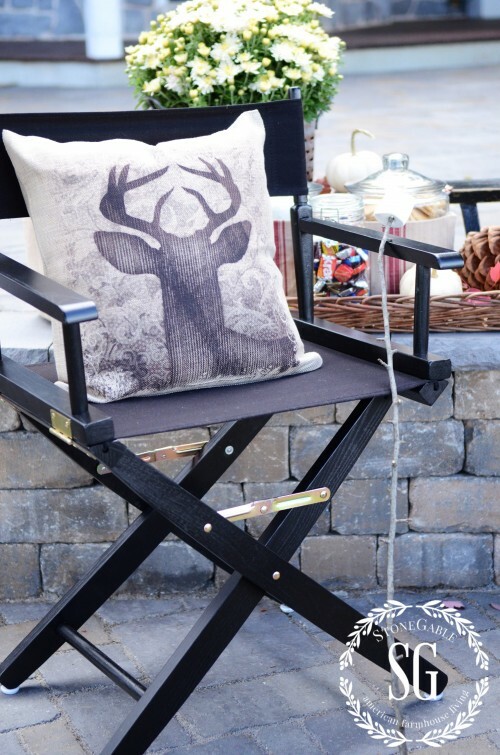 As with everything you do, there are always special touches that make everything look so cozy and inviting! I love S’mores as well, one of my favorite things! I am loving all the burlap, and will definitely check out Heritage Lace! Thanks Yvonne for another fun and fabulous display with lots of ideas. Beautiful! Would love to know where you bought the grainsack covers for the large jars!! They are from Heritage Lace, but I don’t think they have them anymore! Love it all! Which size did you get for your jars, and how big are the jars? Thanks! I’m not sure, I’ve had these jars for years and they are the largest ones I could find. Oh my gosh Yvonne your smore bar looks fabulous and very yummy too!! My kids love making smores at night after swimming! H Yvonne, what a fun idea. I love how everything is so beautifully arranged and inviting. 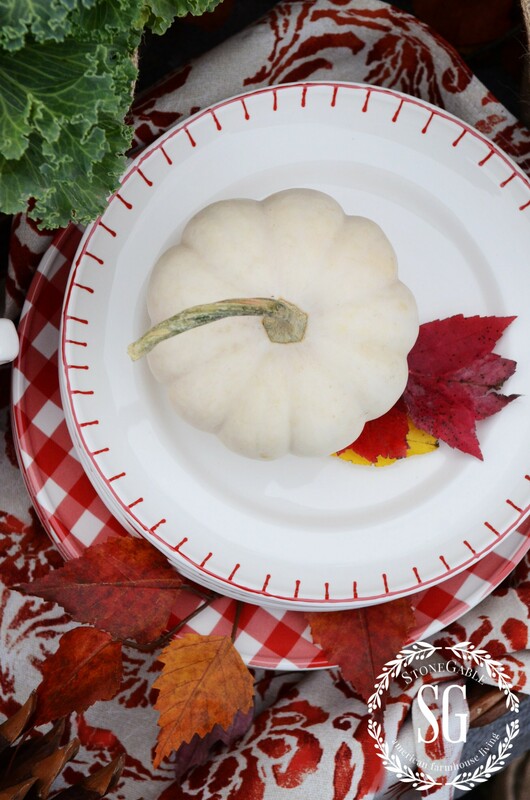 Really cute red and white plates with the blanket-stitched edge. I love this and have wanted to do a smore bar and popcorn bar for a long time!!!! I know you must have gotten this question thousands of times . Would you mind terribly answering it one more time?? Where do you find your large jars? I love seeing them and your detergent jar is wonderful. Nothing like having a few things of beauty in the laundry room. It would be wonderful to have a fire pit but alas! all we have is a chimenia. The large jars came from our local Reading China And Glass store. But I have seen them at Walmart, Target and other big brand stores. if i lived anywhere near your “neck of the woods” i’d sure drop by but it’s a little too far for me coming from alabama! my husband put our new fire pit together last weekend and i can’t wait to have a cookout with all the “big” kids and grandkids…..a day long affair watching football well into the night which is a weekend occurence here in the SEC! i made my first batch of spiced cider and chicken tortilla soup last weekend as we had such great fall weather (cool) but it’s back in the high 80’s this week…supposed to cool down again by the first of next week though! 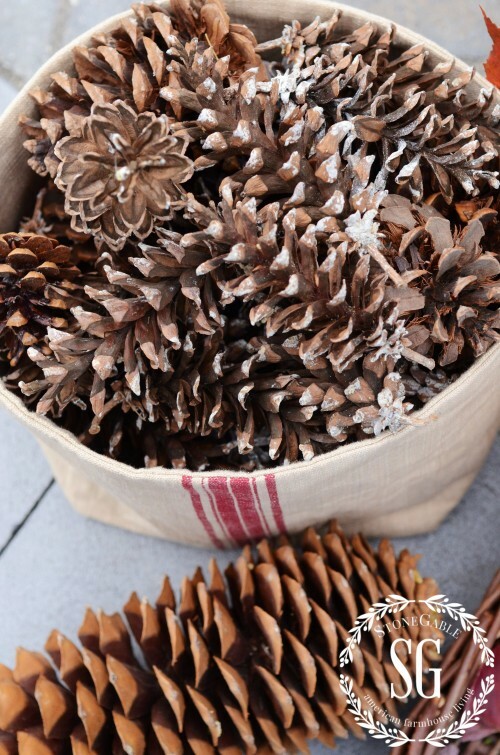 i can’t wait to hear how you use the pinecones….i have a front yard full of them so i’m going to start gathering them up in anticipation of your post. have a wonderful weekend yvonne!